The Golden State Warriors will still be basking in the glory of their NBA title but attention is already turning towards the new NBA campaign. On Thursday the 25th of June, one of the most important events in the NBA Calendar takes place as this is the date for the 2015 NBA Draft. 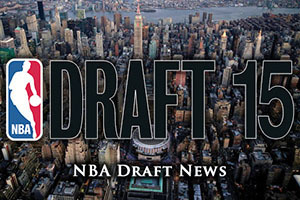 The event takes place in the Barclays Center in Brooklyn and the level of demand for the event means that it is shown on television across the United States by ESPN and there are options for basketball fans around the world to stay in touch with the breaking news that could shape the forthcoming season. If you are new to the NBA Draft, it will not take too long to pick up what is happening. Every summer, the NBA carries out a draft lottery. The teams that didn’t make the playoffs in the previous campaign has a chance to grab a top three pick but the teams who had the poorest records in the previous season, will have a stronger chance of gaining one of these valuable picks. Once the top three picks have been finalised, the remaining teams receive a pick which has been allocated based on their win percentage from the previous season. Have a look at our comprehensive NBA Draft Betting Guide. We encourage you to read this guide if you are new to – or want to know where to wager on the 2015 NBA Draft and who will become this years first pick. For the 2015 NBA Draft, the 2015 Lottery took place on the 19th of May. The Minnesota Timberwolves had the poorest record of the previous season and they held a 25% chance of winning the lottery, which they ultimately did. This means that the Timberwolves have the first pick in this year’s Draft. The Los Angeles Lakers moved up from being the fourth ranked team to grab the second choice and the 76ers have the third pick. The New York Knicks were in line to have the second pick but in the end, they moved out to being the fourth pick. There will always be a number of players who are tipped for the top in the NBA Draft and this year is no exception. One player who is being touted by a broad range of experts is Karl-Anthony Towns. The freshman forward from Kentucky comes in at 6’11” and weighs 250 pounds. This player is the one being tipped as number one by so many people due to his all-round game. You wouldn’t be shocked if Jahill Okafor from Duke is the player that grabs the attention at the end of the Draft but with a strong defensive ability and high work ethic, this is the sort of potential that NBA teams are looking for. D’Angelo Russell from Ohio State is another name that is being spoken of highly for the Draft this summer. As a player has shown maturity beyond his years and he is expected to move within the first five picks of the 2015 NBA Draft. There is also Mario Hezonja, a 20 year old Croatian guard, who has shown some fine form at FC Barcelona. As you would expect, game time has been limited for a youngster at a club of such great sporting pedigree and there have been some questions over his attitude but on the whole, there is a lot of hope and expectation surrounding Mario should be make his way to the NBA this year. A lot of basketball players receive hype in the build-up to the NBA Draft but it is easy to see why Kristaps Porzingis is being talked about. The 19 year old comes in at 7 foot 2 inches and he has the longest wingspan in the Draft. It is unlikely that he will sneak into the first or second selection in the Draft but he should be a player that is snapped up early on. He also has the statistics that will make people take notice although whoever gets a hold of the player will be looking for him to spend some time in the gym to bulk up. Given the amount of backroom trading and dealing that goes on, it can be difficult to confidently predict how any NBA Draft will pan out. Obviously the teams at the front of the queue for a pick have the chance to bolster their squad with some fresh and exciting talent, but it may be that they will eventually move this talent on in the hope of bringing in quality and experience who can move them away from the poor form that they endured in the previous campaign. However, that is all part of the drama and excitement that goes along with the NBA Draft and the 2015 NBA Draft isn’t going to be any different. By the end of this week, quite a few teams will have a clearer idea of how their 2015/16 NBA season is going to pan out.